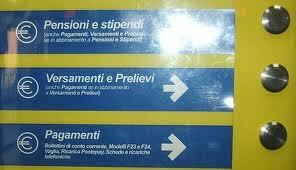 For most of my tenure in Italy I’d rather have had my eyeballs peeled than go to the post office. First, it’s the lines. There’s a take-a-number system, but even so, there are always crowds. Second, it’s the inefficiency. Often you need a particular form to complete business—from mailing packages to renewing residency permits—but there are no forms available, so you can’t complete that business. You have to wait for another day or try your luck at another post office. And delivery service is woefully hamstrung and spotty, too. Mail carriers must provide their own transportation. You may remember the film Il Postino where Massimo Troisi’s character needed a bicycle to get the job because new mail carrier had to deliver mail to Chilean poet Pablo Neruba outside the village. It’s still like that today. I once had a student who delivered mail by bicycle, and I’ve even seen mail carriers riding city busses with their bags of mail. Don’t get me wrong; the staff is pleasant. It’s just that the system is hampered by too many layers of bureaucracy. One place the Poste Italiane do excel is banking services. The post office offers regular bank account with all the services a regular bank has: checks, debit and credit cards, cash machines, etc. The debit and credit cards can be used at points of sale like any other card as well. I think the flaws in the mail system actually make the bank system work so well. I say that because everyone, and I mean everyone, must use the post office to pay bills. When you get a telephone or electricity or other bill it is accompanied by a bolletta, a bill which includes the payee’s vital information including name, address, and post office account number. It also includes the payer’s vital information, minus the account number. The payer takes the bolletta to the post office and pays the bill directly into the payee’s account, getting a receipt as proof of payment. In my opinion, this system developed because the mail service is so unreliable. It is this bill paying scheme that makes the post office so busy. You don’t have to buy stamps or mail a letter there. Stamps are available at tobacco shops and letter boxes are usually outside those. Service at the post office is divided into three areas, and you take a number for each service separately. First, there’s bill paying and other general postal business; second specialized services such as mailing packages, completing government forms, and picking up registered mail; the third area is reserved for clients with post office bank accounts. This third area works like an express line. As a bancoposta customer, I do any normal banking business here but I can also do some other post office business as well. Thus all the people without accounts who are there just to pay bills have a much longer wait. Italy is currently undergoing a census. The paperwork can be completed online or the paper forms turned in to the post office. I’ve been procrastinating because the online service wouldn’t accept my password and I shuddered at the postal line. So I was pleasantly surprised when I last went to the post office to pay bills, steeling myself for the business line with the census. I got to the teller for account holders almost immediately, although there were about fifty people waiting for other services. The teller saw my census form, and took it too. just found your blog re: banking in italy. I'll be in sicily, bolgna/modena and liguria for about 3 months. Your blog has been very helpful as i've tried to figure out how not to travel with a bag full of euros. 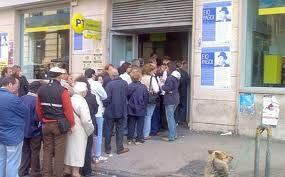 My first stop will be in catania and i'm heading straight to le poste to open an account. Hopefully get a credit card and be able to withdraw cash from atm machines or le poste. We provide solution for the high risk merchant accounts holder for business in high risk industries. There are dozens of high risk merchant accounts processor, several of them need merchants to pay high service charges. Our service is normal at the bottom rates.